Philadelphia 76ers center Joel Embiid is guarded by Miami Heat center Hassan Whiteside during the first half at American Airlines Arena. You would have never guessed the Sixers played a game on Monday night if you were using the post-game conversation to understand what was going on. Analysis of the 113-103 loss to Miami went out the window to focus on what was going on with their big man behind the scenes, after Joel Embiid lashed out about his availability on Instagram. The timing of his message actually worked out pretty well, as it allowed the assembled media to question his head coach about what Embiid is going through right now. Brett Brown told PhillyVoice that he would keep any conversations with Embiid private, but that the reaction from the star center was understandable, and perhaps even laudable. He just wants to play basketball. He wants to be with his team, he wants to play in front of the fans, he wants to see this through. And when he's not able to do that, he gets frustrated, and I respect his frustration. It's born out of competitiveness and it's born out of him wanting to be with his team. The medical side, the different reasons, I'm not going to go there, but I do know the spirit in which he delivers that [post] you just talked about, reflects my conversations with him that is completely driven out of team and competitiveness, I want to play basketball, that type of flavor more than anything. All of this is sort of obvious without being said. Of course Embiid wants to be out on the floor, of course he wants to help them keep overachieving in their first year where they are truly on the rise. He is a competitor with a lot of sweat equity in this program and does not want to be a bystander, whether that's to success or failure. Monday night's loss to Miami, however, did highlight something that should have been obvious even before the game tipped off — the Sixers need Embiid back on the floor, lest the series devolve into a style that doesn't favor Philadelphia. Monday's second quarter was quite easily the worst stretch of basketball the Sixers have played in the series so far. 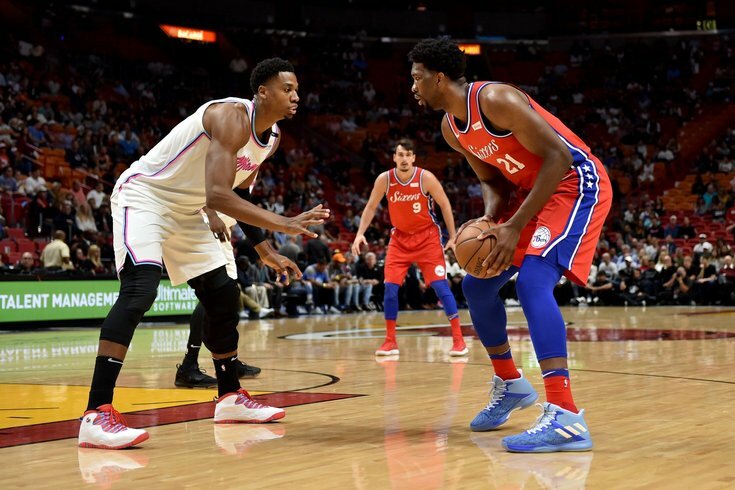 Miami junked the game up in a variety of ways, and though the Sixers would eventually make a run it was the period of the game that ultimately cost them the victory. As was noted in the larger observations post from Tuesday morning, the Heat set a physical tone that the Sixers didn't respond well to. By midway through the second quarter, they had been completely taken out of the game and reverted to the brain cramps we might have seen from the team during their putrid stretch in December. When JJ Redick is running into teammates already attempting to drive, you're having a tough night. That sequence, however, is in part a reflection of what Miami's gameplan forced the Sixers to do. Miami went over just about every screen the Sixers set, trying to play Philadelphia's shooters as tight as they possibly could. After being beaten by a barrage of threes on Saturday night, Erik Spoelstra was determined not to let the same thing happen again. If you can turn Philadelphia's shooters into ballhandlers and passers, they are not necessarily equipped to execute on a consistent basis. The Sixers bailed themselves out of some bad possessions with tough shotmaking, but they did not cope well with Miami getting into their chests and forcing them into roles that don't fit their strengths. A common point of criticism after the game harped on Philadelphia's continued barrage of threes, which kept coming despite the tough night at the office. But Brett Brown saw it a different way: he believes it was as simple as needing their lynchpin on the court. "It highlights the need, when you're seeking to become a whole team, you need Joel Embiid. If you're looking at the second period of the game, [the game] isn't out of wack except for the second period," said Brown. "I didn't think we handled the second period well. They sped up Ben, we learned and saw a different look on Ben Simmons tonight, and in those moments when there are struggles and you speed [Ben] up, that's when you want to post Joel Embiid and settle the gym. I thought tonight was a really strong example for me of when you wished you had him." Embiid post-ups do not always end in points – if they did, there'd be no reason to run any other plays — but they are a change of pace the Sixers can go to at almost any point throughout the game. Nearly 40 percent of Joel Embiid's possessions are used on post-up opportunities — the second-highest mark among high-volume players in the league — and they made up a large chunk of Philadelphia's offense as a result. Embiid used 593 possessions on post-ups this season, per Second Spectrum, and averaged against the team's pace for the season, they represent over 10 percent of Philadelphia's offense in the games he played. That's a massive figure and a must-have wrinkle for a team with a short supply of ballhandlers. He can, as Brett Brown likes to say, "quarterback the gym" out of the post and either search for his own shot or kick the ball out to punish double-teams. The difference between having Embiid on the floor and, say, Amir Johnson, is staggering on offense. Miami is able to get away with the style of defense they've employed in part because they can use their bigs to cut off drives around the free-throw line, without feeling like they're going to get punished for leaving their man. Quick switches and help defense aren't going to be punished to the same degree. With Embiid on the floor, if you put a smaller player on him the Sixers are going to hunt that matchup every time. It's about much more than matchup advantages, of course. Embiid backing someone down on the low-block slows down the game, which can help re-center the Sixers when they get too off-kilter. A strategy centered around trying to throw Simmons off balance if you provide him with a safety valve and a human reset button. Philadelphia's first big change in Game One was the insertion of Ersan Ilyasova into the starting lineup to start the second half. It had major ramifications — the Sixers ran Heat center Hassan Whiteside off the floor, and Miami couldn't figure out a solution to defending four shooters around Simmons. But Miami did discover some cracks in the Philadelphia defense during the second half of Game One, and they kept hammering away at them during Game Two. Though Whiteside gave them better minutes and activity in Game Two, his foul trouble was almost a blessing in disguise for the Heat due to the increased involvement of Kelly Olynyk. Olynyk presents some of the same problems for Philadelphia that Ilyasova has for Miami on the other end. He's a threat to shoot from deep, which pulls big men out to the perimeter where their lack of foot speed is exposed. Ilyasova, in particular, has been brutalized several times on closeouts, where Olynyk has used pump fakes to start collapses and ultimately free up a teammate for an open shot. Holmes is no better, and is probably even worse in this regard than Ilyasova has been. He has been sucked into flying out toward pump fakes several times in extremely limited minutes through two games, and Miami uses his overeagerness against him until Brown decides he can't take it anymore. The difference between a regular season matchup and a playoff series is this is the sort of thing a team can use to punish you over, and over, and over again. Spoelstra has no other team to plan for except for the Sixers, and he sees how this hurts Philadelphia just like you or I would from home. They don't have to adjust their gameplan for a new opponent later in the week, and the onus is on the Sixers to respond. I don't want to overstate the importance of Olynyk in this series — he was 3/8 from the field with four turnovers on Monday — but in a world where Embiid plays, this is obviously not a problem to the same degree. Dribble penetration is the No. 1 creator of open shots on the perimeter unless you have an anchor on the backend who can stabilize things and minimize the help that needs to be sent. We don't need to belabor this point, but Embiid is a transformative defensive player. Even Markelle Fultz, who has played very little with the big man up until this point, has felt the difference with Embiid on the floor. "He's a competitor, he loves this game so much," said Fultz at practice on Tuesday. "Everybody knows he's a low-post presence, who can score at any given moment. Then at the defensive end, we have someone else who can alter shots or have your back once you get blown by, or maybe have a mistake." Embiid's recovery speed and length is on another planet from any of Philadelphia's other big men. He'll have an adjustment period after returning from a layoff, so nobody should expect perfection. But they're having to trade one side of the ball for the other every time they make a substitution at center right now, which is not something you have to worry about with Embiid. Against a Miami team with a lot of guys who you would describe as rock solid, the lack of a pacesetter at the pivot is finally starting to catch up to them, all these wins later. These assertions come attached to a harsh reality: it doesn't matter how badly Embiid wants to play or how much he'd help the Sixers if he's not cleared to suit up. Though the team continues to stress incremental progress — he was scheduled to go through shooting and scripting drills with the team for the first time — as of Tuesday afternoon he had still not been a participant in full-contact activities. The response to Embiid's angsty Instagram post has been near universal from the fans. "Why don't they let him play?!" But even if we throw out Embiid's personal medical history as a part of why the Sixers would be ultra-cautious, this specific ailment deserves to be taken seriously. We're not talking about playing through a sore shoulder, tendinitis, or some other sort of minor ailment. Embiid is recovering from surgery on the bone surrounding his eye. Everyone's body heals and responds differently, and if the specialists consulting with the team have ruled the area is a potential risk (short or long-term) then you can't take any chances with the anchor of your franchise. Garden variety injuries are more repairable than ever with the medical technology professional athletes have access to. But in a worst-case scenario, trotting back out there too soon could expose Embiid to the possibility of vision damage, which is not something you want to play around with. Keep in mind, this is all speculation because Embiid's information is being protected heavily by anybody involved with the Sixers. His coach insisted on Tuesday afternoon that the Sixers continue to work in tandem with the various people in Embiid's life, and only have his best interests in mind. "There is a very unified effort with his representation and the people around him, with the people that did the operation, the doctors with our medical staff, with the team, with me, the coaching staff. We're all doing this," said Brown. "There's a unified sort of spirit and line of communication." How long will that unity last? The only person who can answer that question is Joel Embiid. He has already resorted to lashing out in frustration, and things will only get worse if the Sixers find themselves down 2-1 after Thursday's game, assuming Embiid isn't ready to go by then. It's up to the rest of his running mates to hold the line, and buy him whatever time he needs to reintegrate himself. Given his role in putting them in this position in the first place, they owe him at least that much.